For the campaign during the First World War, see Military operations in North Africa during World War I. ^ "Military Operations in North Africa". www.ushmm.org. Retrieved 25 May 2017. ^ Boundless (12 January 2017). "The North African Front". Boundless. Playfair, Major-General I.S.O. ; and Molony, Brigadier C.J.C. ; with Flynn R.N., Captain F.C. & Gleave, Group Captain T.P. (2004) [1st. pub. HMSO 1966]. Butler, J.R.M (ed.). The Mediterranean and Middle East, Volume IV: The Destruction of the Axis Forces in Africa. History of the Second World War United Kingdom Military Series. Uckfield, UK: Naval & Military Press. ISBN 1-84574-068-8. 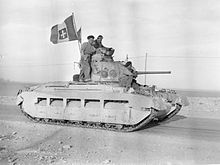 Wikimedia Commons has media related to North African campaign.